Mansfield Musings Blog: Stags’ worst display in years? After my blog detailing the Northampton game, a handful of comments suggested that I was being too hard on the team and not giving them enough encouragement. If you were one of those people, you may not wish to read the rest of this post. It has taken me a full two days to feel capable of reporting on the game I witnessed at Oxford on Saturday, which was the worst performance I have seen in many years. The minimum you expect from a team of professional footballers is effort, commitment and a smattering of ability, even just to do the basics. I think the maximum number of passes stringed together all afternoon by red and white shirts was four, all probably in the first twenty minutes of the game. Some players out there did not look interested at all. Add to that another panicky substitution at half-time by Adam Murray, as he replaced the cautioned Jack Thomas with a second striker in Rakish Bingham, with Mansfield still well in the game at 1-0 down and with a midfield already beginning to get overrun. It was a shambles from that minute onwards as the team and management, devoid of ideas, got taken to the cleaners by Oxford, who were handed all three goals on a plate. The Stags made one change from the midweek win against Luton, with new loan signing Jeffrey Monakana replacing Reggie Lambe in the starting line-up. That was a bit harsh on Bingham after his match-winning contribution, but Monakana has plied his trade at a much higher level and has pace to burn, which may be useful to the Stags on the counter attack. Mansfield looked bright early on, a trademark long throw from Elder flicked on by Tafazolli and headed wide by Oliver. At the other end, a near post corner caught Ravenhill on his heels and allowed Long to head just wide. It didn’t take long for new boy Monakana to show fans what he can do. Having already worried Oxford’s defence with a mazy run, he set off again down the right and into the area, but his shot was a long way off target and possibly the wrong option with men arriving in the middle. Moments later, a long ball over the top was chased down by Oliver, who showed great strength to get to the ball and hit a shot across the keeper. The shot hit a bobble and almost embarrassed Ryan Clarke. 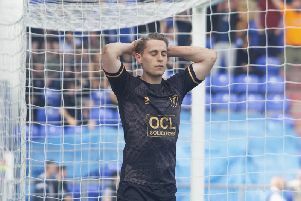 A quiet 15 minutes ensued until a turning point in the game, when young Jack Thomas was awarded a third yellow card in as many games. It was a challenge that did not need to be made deep in Oxford’s half, near the left corner flag. There did not appear to be much contact but you are asking for a yellow card when you slide in without much chance of getting the ball. The early Mansfield tempo appeared to drop and the midfield began to get overrun, the Stags’ all too familiar trait of not being able to manage the ball allowing Oxford the chance to attack and play some neat football. The pitch was not in the best condition it must be said, but the opposition were managing to keep the ball and even if the Stags played at the Bernabeu every week I do not think it would improve their possession stats. The home side were ahead in the 31st minute. A throw-in to Oxford in Mansfield’s left back position was taken short and miscontrolled by Hylton into the path of Junior Brown. He returned the favour by allowing the ball to run under his foot to Oxford debutant George Baldock. Baldock beat Brown too easily and whipped a cross in towards the near post, where Pidgeley went up for the ball with Hoban and completely missed it, allowing the ball to run to the impressive Alex MacDonald, who slid the ball calmly under the desperate challenge of Richie Sutton and into the empty net. By today’s standards Pidgeley may feel a little hard done by not to be awarded a free kick but personally, had we scored a goal like that at the other end, I would have felt aggrieved had it been chalked off. Goalkeepers get too much protection in the modern game and tellingly he was the only Mansfield player who actually protested to the referee - another soft goal conceded by the Stags. Oxford played the rest of the half out well and now looked a threat every time they went forward. The Mansfield players had slacked off and the home side were able to roll the ball too easily into the strikers and build from there. Sutton and Elder were getting zero protection from Brown and Monakana. Brown was having a terrible game and did not look interested, whilst Monakana only came to life when he was given the ball to feet. The Stags were almost level just before half-time when Simon Heslop smashed a volley from 25 yards, which took a deflection and went just wide of the post. Monakana again set off on a great run down the right but his end product was severely lacking. The half-time whistle came and, despite Mansfield hugely lacking any fluency, they were still in the game and I felt optimistic that we could still grab something from the game, thankful that at least it would not be 45 minutes of nervously defending a one goal lead. The teams came out for the second half and Mansfield were making a change, Bingham on for Thomas. In my opinion Adam Murray panicked. This is the third time in eight games that he has made a change at half-time. With half the game remaining and only one goal needed to draw level, there was absolutely no need to change the formation and weaken a midfield which was already being overrun. I understand that Thomas was on a yellow card, but if the manager trusts him enough to start a game, surely he trusts him enough not to get sent off? He was the only player capable of keeping the ball in a Mansfield shirt, which given his tender age is a damning indictment against the rest of the team. But if Murray was so set on substituting him, why not bring another midfielder on? He even went as far in his post match interview as to openly admit that the the team was running on empty, which makes his switch to 4-4-2 senseless. The second half whistle blowing was as good as it got for Mansfield, who turned in another abysmal second half display. The hosts were on the front foot straight away, the effervescent MacDonald crossing for Hoban to head wide and also having a long range drive of his own pushed around the post by Pidgeley. On 52 minutes Hylton was lucky to still be on the pitch after jumping with his elbow raised and catching Martin Riley. It looked a red card from where I was sitting, but referee Andy Woolmer only deemed it worthy of a booking. In the build-up to Oxford’s second goal, Martin Riley had possession of the ball. He took it down on his chest, with no Oxford player within 10 yards of him. Instead of putting his foot on it, he casually looped the ball straight back to the opposition. One of the things I hate the most in football is needlessly giving away possession. It frustrates me when fans around me berate a player for doing something risky, or passing sideways or even backwards, but ultimately keep the ball. You cannot concede a goal if you have possession of the ball. Sometimes it feels like our defenders cannot win with some fans. They are damned if they hoof the ball downfield, and they are damned if they play the ball along the back four. From the same conceding of possession, Oxford were ahead on 54 minutes. Hylton picked up the ball just outside the Mansfield area and cut inside a powderpuff challenge from Riley to be halted in his tracks by an excellent Tafazolli challenge, hurting the Mansfield defender in the process. With Tafazolli still down, the ball ran loose to O’Dowda, who sauntered past a further two pathetic attempts to win the ball by Sutton and Riley. O’Dowda’s shot was excellently saved by Pidgeley. Again, the ball ran to an Oxford shirt, eventually finding MacDonald, who arrowed an unstoppable drive into the corner of the net - kamikaze defending by Mansfield yet again. The Stags had not created a single opening in the second half and after going 2-0 down seemed to lose all interest. Tafazolli was booked for a challenge which was not even a foul, never mind a yellow card. He was the only Mansfield player still on the field with any sort of credit, but that diminished soon after when Oxford went three goals to the good. A long throw from the Oxford right made Tafazolli look terribly clumsy, as he appeared to try to head the ball, only for it to ricochet off his knee and into the path of Hoban. In an attempt to atone for his error, he lunged for the ball, which he did not win and Hoban went over his outstretched leg. A clear penalty in my opinion. When you go to ground in the area, a mile away from the ball, I have no sympathy. In fact, he was lucky to still be on the field after his previous yellow card. Hylton never looked like missing from the spot and duly despatched the kick, sending Pidgeley the wrong way. Mansfield now looked well and truly beaten. There was no spirit or desire being shown by anyone out there. Murray threw on Billy Kee for Vadaine Oliver. Oliver had again had very little service but his hold-up play was poor, one of the main traits needed to play as a lone striker. The Stags should have been given a brief glimmer of hope on 75 minutes, when Hylton tried to handle the ball into the net. A deliberate hand ball, which by the letter of the law should be at least a booking, Andy Woolmer had a clear view of the incident and awarded a free kick to the Stags, but no yellow card to Hylton - a shocking decision by the referee. Hylton, who was substituted shortly afterwards, has even admitted he was lucky to avoid a red card. In my opinion, the decision did not affect the scoreline, let alone the result, as Mansfield would not have scored if they were still playing now. Lambe came on for Brown on 76 minutes. The scoreline could have got worse moments later as Pidgeley took far too long in clearing an Elder back pass and cannoned it against Roberts. The ball narrowly avoided the bottom corner of the net. If the net had rippled, it would have summed up Mansfield’s shoddy afternoon. The final 15 minutes were largely uneventful as Oxford comfortably held on to their three goal cushion. The Stags did not muster a single attempt on goal in the second 45 minutes, and only one on target in the entire 90. I can comfortably say that it was the worst display of the season by Mansfield Town. They were lacking in so many areas it would take too long to list them. The only positive to emerge from Saturday was that the majority of the teams fighting against the drop had also failed to pick up points. At the moment, it appears to be one step forward and two steps back. Then why not freshen up the team Adam? One change was made from Tuesday night. A clear sign that the manager has little faith in the players who were sat on the bench. This is a manager who has brought eight players to the club, including the signing of a promising winger a day before the game, and he tells the fans and his squad that none of them possess the ‘X-factor’. I hope Mr Murray is not planning for a career in motivational speaking should his management career not pan out as he hoped. With his above comments post-match, and admission that he knew Oxford would be one of the toughest games, it was almost as if the Stags were aiming for damage limitation. I wish he would have let the 322 travelling Mansfield fans know his expectations beforehand! The performance was so bad I almost feel we should receive a refund for having to sit through it. Whatever the manager says, the game against Dagenham and Redbridge on Saturday is certainly winnable and I would not be happy with anything less than three points. The Stags are heavily reliant on their home form at the moment and must put in an impressive performance to wipe away the memories of Saturday’s turgid showing. Pidgeley - 5 - At fault for the first goal. Kicking generally poor. Did make a couple of saves and no chance with the second and third. Sutton - 5 - Had no help from Monakana in dealing with winger but soft challenge in the lead up to the second goal. Riley - 4 - One of the poorest displays I have seen from a Mansfield player. Gave the ball away all afternoon, including for the second goal which he followed up with two weak challenges. Bullied by Hoban and Hylton. Tafazolli - 5 - A couple of good challenges but at fault for the third goal. Elder - 4 - No help from Brown in dealing with winger. Poor distribution all afternoon. Ravenhill - 4 - Game passed him by, when he did get the ball he gave it away. Anonymous second half. Monakana - 5 - Looked threatening with the ball but poor end product. Stood out on the right and didn’t get involved enough. Did nothing to help defensively. Heslop - 5 - Started off energetically but faded. Kept giving the ball away. Thomas - 6 - Silly booking but did at least keep the ball for the most part when he was on. Playing beyond his years at the moment. Brown - 4 - Did not look interested from the first whistle. Did nothing of note in the entire game. Lucky to stay on as long as he did. Oliver - 5 - Had no service but must hold onto the ball better. Bingham (Thomas 45) - 6 - At least looked like he was trying, but no service. Kee (Oliver 72) - Huffed and puffed but to no avail. Lambe (Brown 76) - Hardly touched the ball.